Once again, Panahi is driving, the confines of his car becoming his studio, echoing the restrictions he’s under. And again, his technique whilst banned is to subtly blend reality and fiction, so that – if it were to come to it – it would be hard to say definitely whether what you see on screen is a film or life. It’s so unobtrusively shot that it seems to be happening before your eyes. Implicit is the question, when does a film become a film? The two personas of Lorraine Kelly were recognised in the recent court judgment (on her tax status). 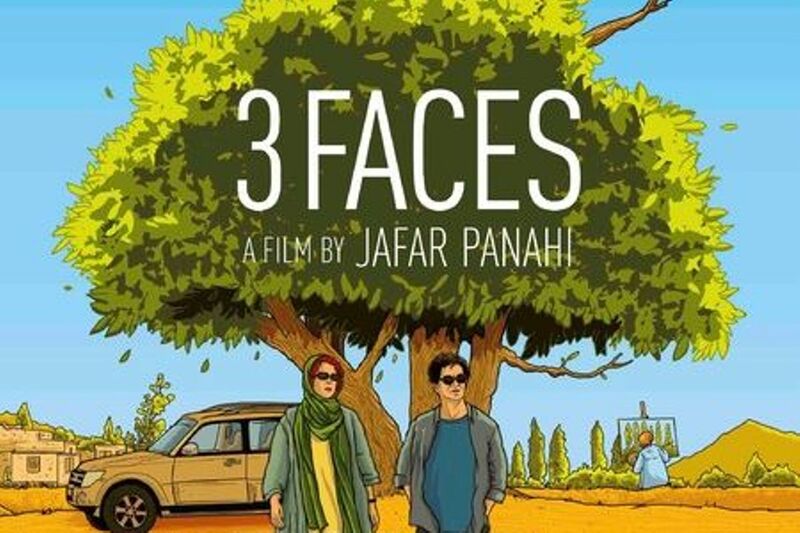 In 3 Faces Panahi appears as himself, but could he in fact be performing as a persona of himself? He’s observant, self-effacing, empathetic to people of all types, sympathetic to women’s issues, wise, and always a film director. In 3 Faces he has persuaded popular film and TV actress Behnaz Jafari, also playing herself, to come with him on a road trip to a remote village in the mountains on Iran’s border with Azerbaijan because he has received a text meant for Behnaz with a video made by a desperate young woman from the village, Marziyeh (Marziyeh Rezaei), appealing for Behnaz’s help. Marziyeh wants to be an actress but her family are preventing her taking up a place at the conservatory in Tehran. The video, sent by Marziyeh’s friend, ends with her apparently hanging herself. Panahi and a distraught Behnaz debate whether or not what they saw was actually real during the long drive through the rocky countryside to find out if she is really dead. They finally arrive at the tiny village, but though Behnaz’s face is familiar from her role in a TV soap opera, their welcome falls flat when the villagers realise they haven’t come to help them with their electricity or water shortage problems. The search for Marziyeh reveals the repressive patriarchal attitudes to women existing in the isolated, traditional society, and the prejudice against a woman wanting to be what they disgustedly describe as an ‘entertainer’. Marrying Marziyeh off would have made her forget all about her taboo ambition to be an actress, is the prevailing opinion. Society can’t live without rules, they say, and the villagers have developed an elaborate system of cooperation for driving on the narrow mountain tracks instead of lobbying to get a wider road built that’s a metaphor for rigid thinking and lack of progress. A succession of characters tell their stories: an old woman chooses to sleep in her grave, an elderly man recounts the importance of the meaningful disposal of his son’s foreskin and the story of a prize stud bull – all are illustrations of the masculine bias of society. Also living in the village in secluded retirement, after facing initial hostility, is Sherzhad, a famous pre-Revolution actress and singer, now painting and writing poetry. We never see her, except in distant silhouette, but she’s a presence throughout, representing the face of a different Iran from the past: Behnaz is the present face and Marziyeh, the future. The final long take of the two of them obliquely implies there may be hope for women’s independence. 3 Faces premiered at the Cannes Film Festival and is released on 29 March 2019 in the UK.